A brand built on history, VAUGHAN Hand Tools were founded well over a century ago. The hammers they manufactured back then, still play an important role at home and work today. 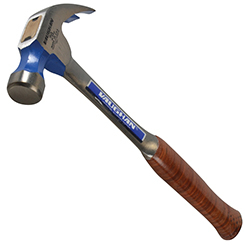 This manufacturer set the industry standard for all basic hammer designs; from the distinctive curve of the claw, to the set of the handle and the shape of the head. Since then the company has grown phenomenally and now uses new manufacturing techniques. With advanced changes in technology, Vaughan have transformed from a small maker of hand tools to a leading manufacturer of hundreds of different striking tools, these now include: saws, blades and pry bars. VAUGHAN’s ongoing commitment to improvement is reflected in the output from their tools. Choose from a wide selection of their quality products at My Tool Shed today.